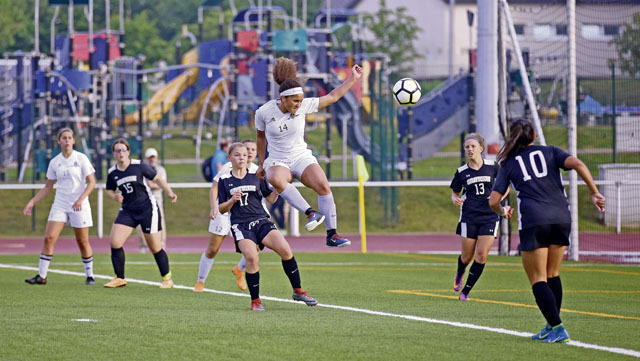 The 2018 soccer season was one of extreme highs for Ramstein, even if the Lady Royals lost in the championship game. The team went undefeated leading up to the finals and didn’t lose until an overtime shootout. It all sits well with the players and coaches. Ramstein was indeed undefeated but had tied Stuttgart 1-1 in the regular season – the only thing that kept their record from being perfect. 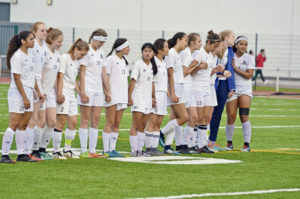 The Stuttgart team was also undefeated with the one tie, which gave clear indication that these were the top two Division I girls’ soccer teams in Europe. The first half saw more action down on the Stuttgart end but Ramstein junior goalkeeper Morgan Lewis deflected all shots on goal to maintain the scoreless tie at the intermission. Later, Aurora Davis and other Ramstein shooters began to take aim at the Stuttgart net. And just one goal would be all it would take to win this championship battle royale. Since none were scored in regulation, the teams delighted the large crowd in attendance with a dynamic shootout session. Haley Deome and Haylie Scott started the RHS surge with shootout goals and then it was back and forth as Lewis and Stuttgart goalkeeper Sammie Kellogg each stopped some and missed some. After the first five shooters for each team couldn’t break the tie, the rest of the roster opened up to shoot. Ramstein seniors Brittany Cunningham, Gabs Janes, Elizabeth Noel, Baleigh McFall, and Mendenhall graduated knowing there was nothing more to be done. They were supported by a host of underclassmen that will return and push the program to try and create another solid season for 2019. Deome had 12 goals and Madrid, Spain product Rocio Fernandez had nine more but there was production from many others during the season. Janes and Davis combined for 13 goals plus goalkeeper Lewis only allowed four scores during the entire Ramstein regular season.